Male, Maldives – Maldives’ President Abdulla Yameen has conceded defeat after a surprise election win for the opposition in a poll that was billed as a test for democracy in the troubled island nation. “The citizens of the Maldives had their say … and I accept that result,” Yameen said in a televised speech on Monday. The 59-year-old, who presided over a five-year crackdown on dissent, said he met with president-elect Ibrahim Mohamed Solih at the president’s office in Male shortly before his speech. “I have congratulated him,” Yameen said. The remarks came hours after the National Elections Commission confirmed a decisive victory for Solih, a long-time member of parliament, who ran representing a coalition of four parties whose leaders are either in jail or exile. Solih won with 58 percent of the vote, or 134,616 ballots, while Yameen garnered 96,142 votes or 42 percent, the official count showed. Turnout in the election, in which more than a quarter million people were eligible to vote, was more than 89 percent. Yameen said he has “served the Maldivian public sincerely” to ensure economic prosperity for the country. “The result of that service is clear, and I thank the thousands who accepted that and voted for me,” he said. The president, who ran on a platform of defending Maldives’ Islamic faith and boosting the economy, said he will stay on in the presidency until his term ends on November 17. Yameen’s running mate, Mohamed Shaheem Ali Saeed, a Muslim scholar with close ties to Saudi Arabia, also congratulated Solih in a post on Twitter, saying he hoped for “positive changes” in the country. The contentious election on Sunday took place against a backdrop of uncertainty and fears of rigging and was closely watched by India, the United States, European Union, China, and Saudi Arabia. Even before the elections commission announced its results, both India and the US issued statements congratulating the people of the Maldives. New Delhi, which has criticised the rollback of democracy under Yameen, said the election “marks not only the triumph of democratic forces in the Maldives, but also reflects the firm commitment to the values of democracy and the rule of law”. The US Department of State said the Maldivian people had “raised their democratic voices to determine the future of their country”, and urged “calm and respect for the will of the people”. The Maldives, better known for its luxury honeymoon resorts, has been in turmoil since its first democratically elected leader, Mohamed Nasheed, was forced out of office following a police mutiny in 2012. The trouble only intensified under Yameen, who assumed power following a disputed election the next year. He has jailed or forced into exile nearly all of his opponents, suspended parliament for long periods of time, and declared two states of emergency after citing threats to national security. Faced with widespread international criticism, he pulled the Maldives out of the Commonwealth in 2016 and fostered closer ties with China and Saudi Arabia over traditional allies India and the United Kingdom. The president is also accused of overseeing the embezzlement of at least $79m from tourism revenues, an incident that was the subject of a 2016 Al Jazeera investigation. In the lead-up to the vote, there was fear in Male that Yameen may not accept the results of the vote, given his past refusal to tolerate any dissent. Yet, as tallies from the opposition and media outlets showed Solih maintaining a strong lead over the incumbent president, anxiety in the capital gave way to disbelief and joy. 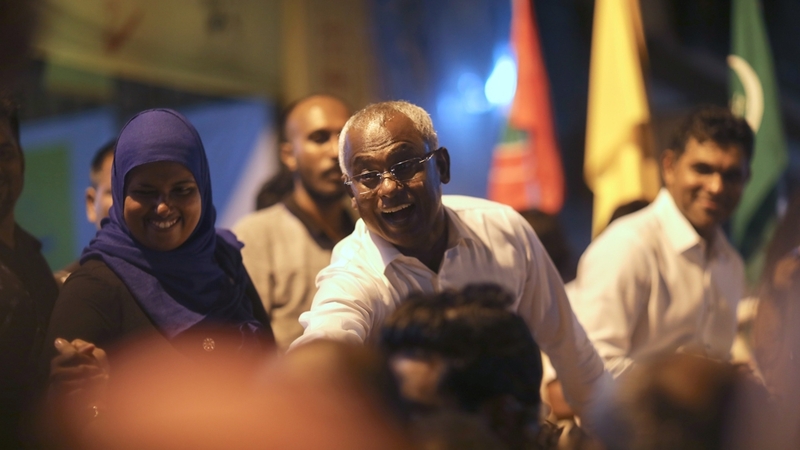 Solih declared victory soon after 90 percent of votes were counted, prompting huge celebrations that ran into the early hours of Monday morning in Male’s narrow streets. “This is a moment for happiness. This is a moment for hope,” Solih told reporters late on Sunday night. Shortly after Solih’s declaration, hundreds of jubilant opposition supporters gathered at their main campaign office, waving yellow and green flags as they sang, danced and exchanged hugs. Later in the night, a group of people pulled down a massive wooden cutout of Yameen on the country’s first bridge, the president’s crowning achievement that was opened just weeks before the vote. On Monday morning, on a quiet street corner in Male, 43-year-old Ahmed Adhuham, responded to the president’s concession of defeat, saying he was “very happy”. “I did not think he would let go so easily,” he said. 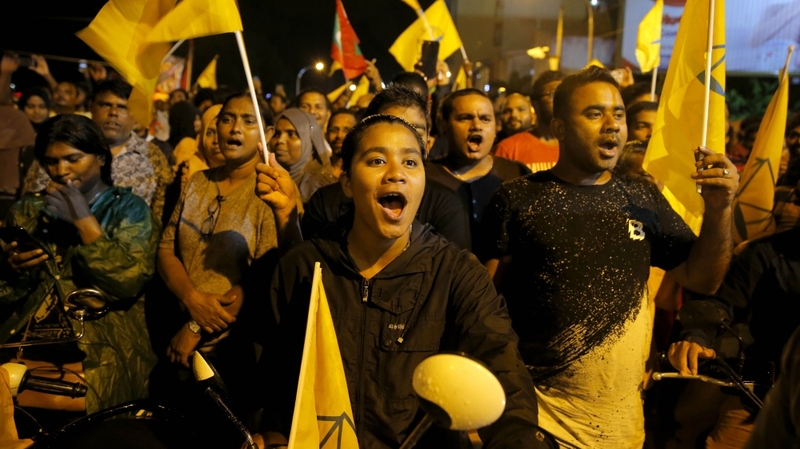 Mariyam Shiuna, executive director of Transparency Maldives, an election monitoring group, said the results showed “that no matter how much you try to manipulate laws and the system, ultimately it is the people that will decide who gets to govern them”. “This is an opportunity to reclaim our lost democratic space and I hope the opposition keep to their promises and uphold democratic values above all,” she added. Meanwhile, in what was perceived as the first acknowledgement of the opposition’s win from a government official, Fisheries Minister Mohamed Shainee said the vote signalled “a new chapter” for him and the country. “This is politics,” he said in a post on Twitter. Ruling party supporters on social media said they were still proud of Yameen and his economic achievements, which also include new airports and dozens of new resort openings. Isha Afeef reported from Male. Zaheena Rasheed reported and wrote from Colombo. When a man kills his wife in India, what happens to the children?